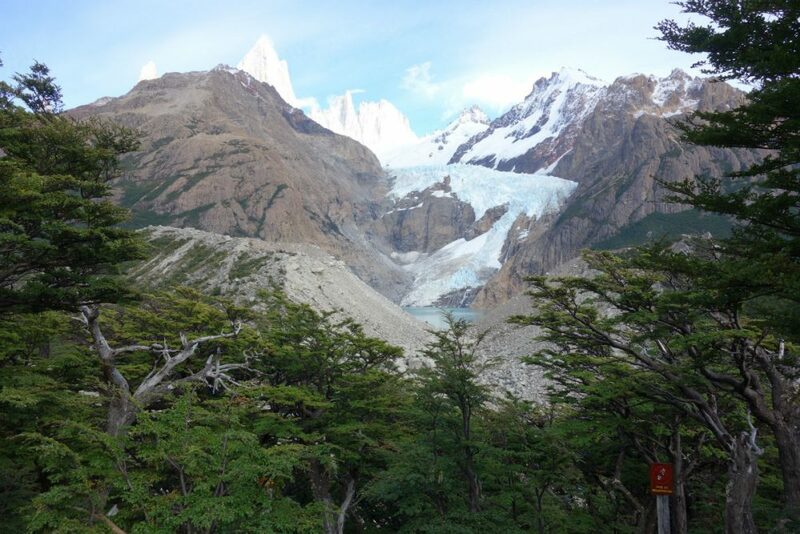 A forest of lenga trees in the foreground, Argentina's Mount Fitz Roy peeking out from the background. A view of Mount Fitz Roy from the trail. 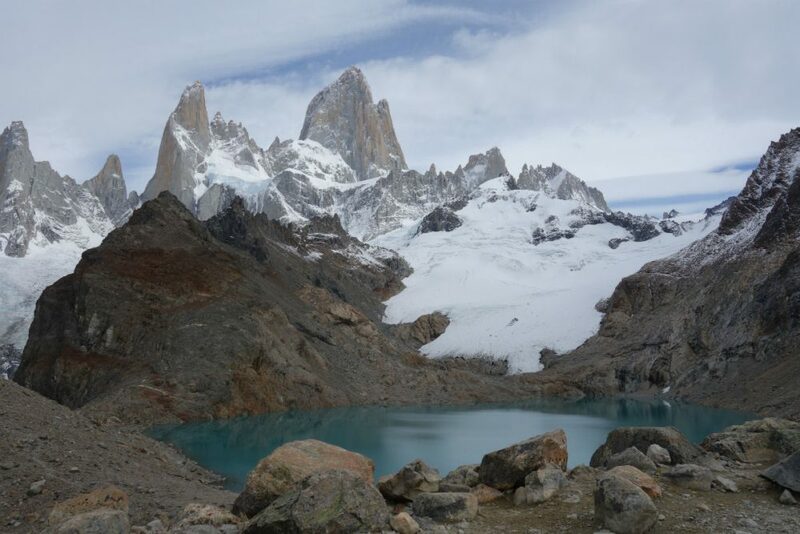 The Laguna de los Tres is fed by glaciers on the slopes of Mount Fitz Roy. 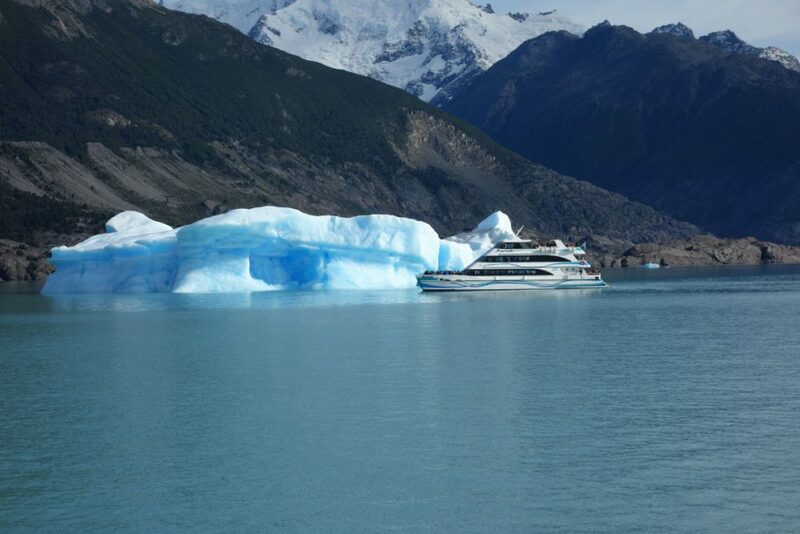 An iceberg dwarfs a sightseeing boat on Lago Argentino. The approach to Estancia Cristina, via Lago Argentino. 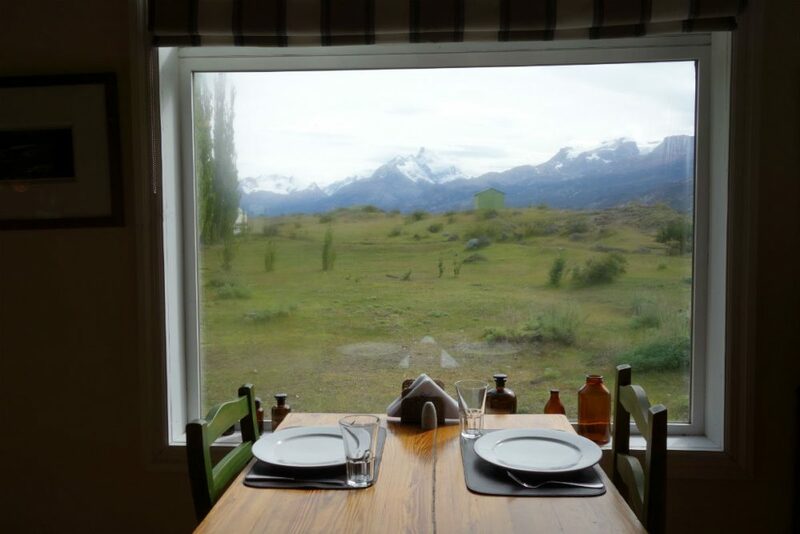 The view of the mountains from Estancia Cristina's dining room, in Argentine Patagonia. 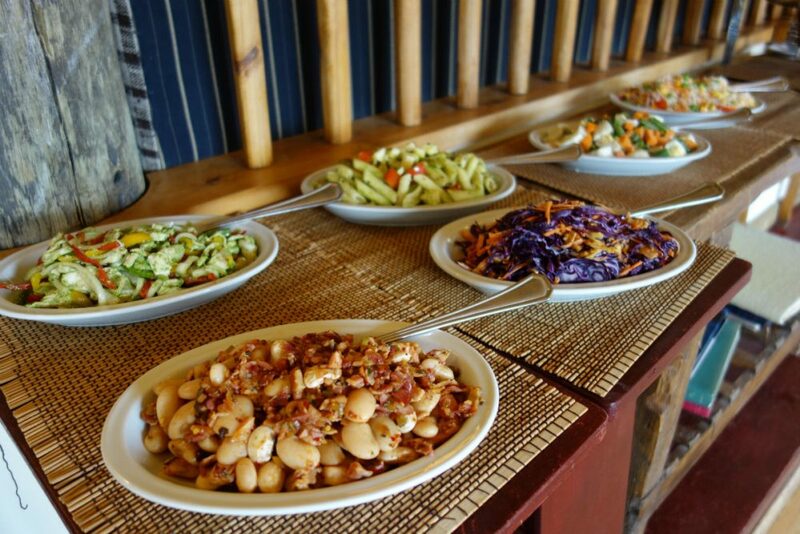 A bevy of delicious salads are just a taste of the daily lunch spread at Estancia Cristina. 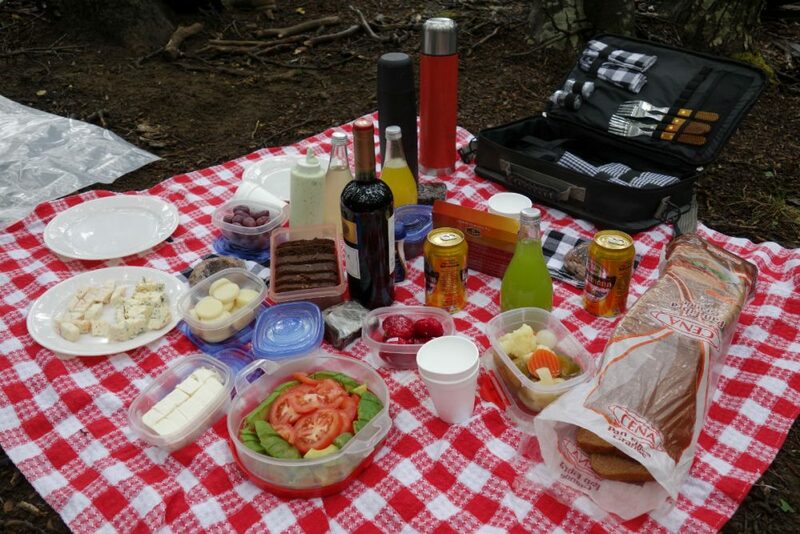 The Patagonia picnic that was hauled ten miles up a trail in a backpack for us to enjoy. Unfortunately, the viewpoint to the Paine Towers was closed—but the other hikers sure looked enviously at our spread. 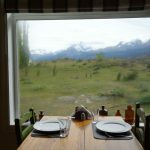 Room with a view at Hotel Rio Serrano, just outside Torres del Paine National Park. 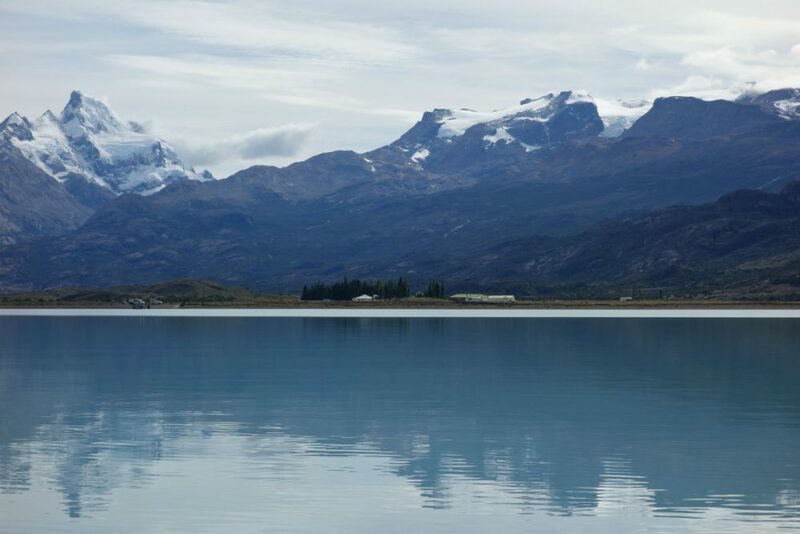 A view of Torres del Paine's crystalline lakes from the French Valley. 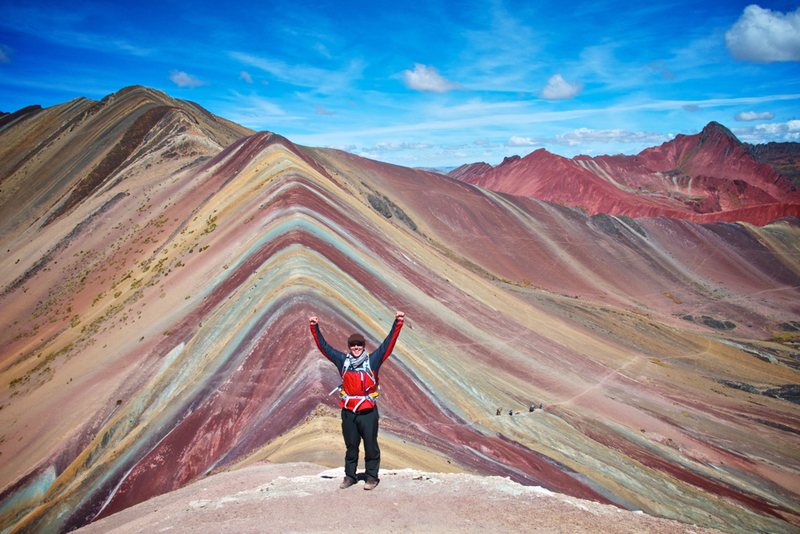 I’ve hiked all over the world, from New Zealand’s Milford Track to Kilimanjaro to the Tour de Mont Blanc. When it comes to traversing dirt paths on foot, you might even call me a connoisseur. 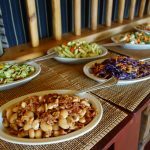 And so it was no small thing when, on my first day in Patagonia and between forkfuls from a heaping salad, I declared the hike I’d just completed to be the best I’d ever seen. Twenty-four hours later, I found myself reconsidering. Chowing down on tourist town-quality pizza, I had to admit that that day’s hike now topped my list. 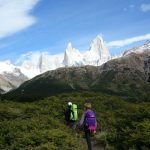 Such are the delightful difficulties you’ll suffer through in Patagonia: deciding which trail—each with its own collection of showstopper views toward the sharp granite peaks that are Patagonia’s trademark—is your favorite. There’s a reason that Patagonia ends up on so many greatest-hits travel lists: Rising up from an otherwise scrubby wasteland, these mountains are as beautiful, and as captivating, as any others on the planet. 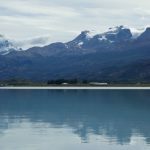 Putting together the perfect trip to Patagonia on your own can feel overwhelming, though, given the vastness of the region. 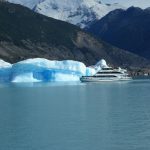 That’s why I called on Trusted Travel Expert Tom Damon, who crafted an itinerary that included stunning hikes, gaucho-chic lodges, and an introduction to the glaciers that carved this incomparable landscape. 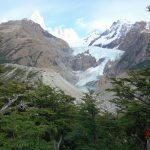 Patagonia, like many far-flung corners of the world, can be surprisingly expensive, particularly when compared with other parts of South America. There are a few reasons for this: First, the region is extremely remote, making it costly to bring in provisions—everything from fuel to food to cleaning supplies. 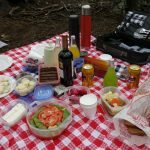 Our picnic lunches, for instance, traveled 75 miles from the town nearest Chile’s national park (many ingredients surely traveled much farther than that, though the caterer made smart use of plums from her own trees, wild-growing rhubarb, and other local produce). Second, the season is short, so businesses that cater to tourists—which are most of them—have to earn a year’s income in just a few months. Third, the population is sparse, so there is high demand for the relatively few local guides who combine the hiking prowess, charisma, and knowledge of local history and geology that are all required to do the job right. 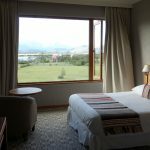 There are some certifiably luxurious lodges in Chilean Patagonia, but most command high prices not for their expertly trained staff or high-design rooms (many, in fact, feel downright generic). 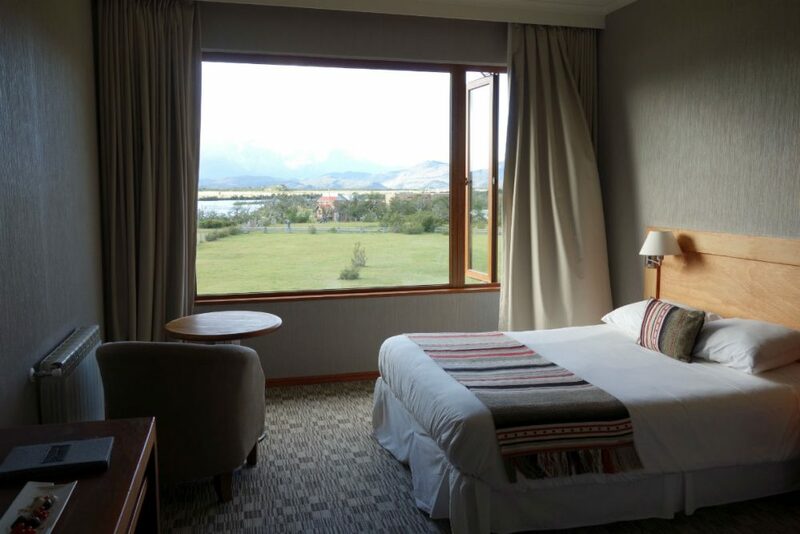 A five-star hotel in Argentine Patagonia probably wouldn’t earn that rating in the Pyrenees. What you’re paying for is proximity to awe-inspiring mountains. 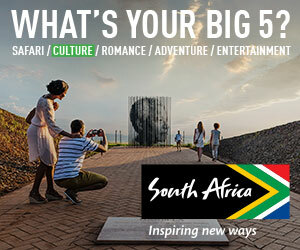 Be prepared to spend $1,000 to $1,250 per day (for two travelers) for a WOW trip. Patagonia ignores political boundaries, encompassing the southern portions of both Argentina and Chile. (According to my Chilean guide, he and many of his neighbors feel more kinship toward Argentine Patagonians than they do toward the citizens of northern Chile.) 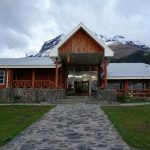 And while the tourist centers of southern Patagonia are just over 100 miles apart as the condor flies, that condor would be swooping over mountains and ice fields; driving between Argentina’s Los Glaciares National Park and Chile’s Torres del Paine National Park takes at least five hours, with an additional 30 minutes or more allotted for the border-crossing rigmarole. Transit time to Patagonia from the east coast of the U.S. is a day and a half—two full days from the west coast—and that assumes you don’t want to explore Buenos Aires or Santiago (which you should, if you haven’t been to those cities before). 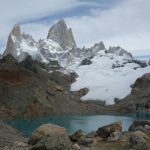 So a two-week trip leaves you just enough time to knock off all of Patagonia’s marquee hikes, with a few days’ cushion should the notoriously fickle weather force you to rejigger your itinerary on the fly. 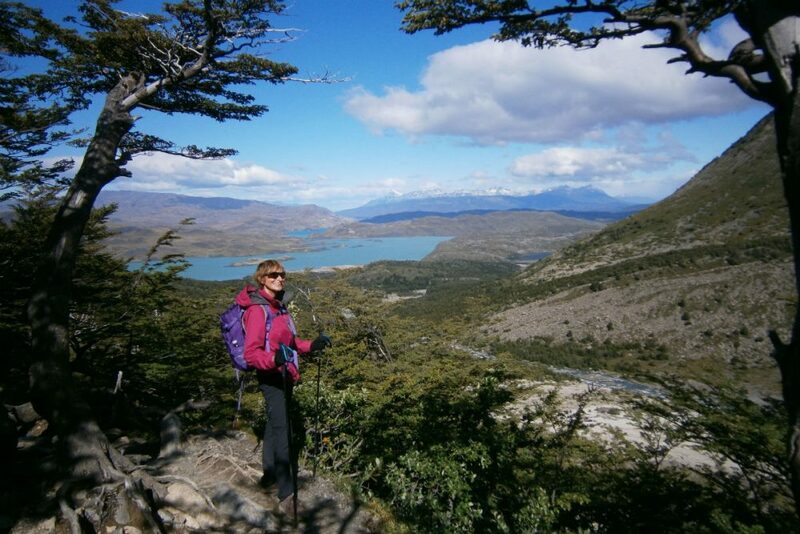 The most famous trails in southern Patagonia are 8- to 12-mile round-trips that climb gradually at first, then with a short, steep ascent to the base of a granite peak, where a milky turquoise or jade green lake is fed by glacial runoff. I saw everyone from teens in cutoffs and Converse to trekkers with 30-pound packs complete these hikes. Since the peaks above are smooth and nearly vertical, only technical climbers can go any farther. All trails start close to sea level, so you never have to deal with the effects of altitude—unlike famous routes through the Andes, Alps, and Himalayas that leave you gasping for oxygen. Make no mistake, you’ll have wanted to do some training at home, but you needn’t have the lungs of a marathoner or the legs of a power lifter to achieve hiking nirvana. 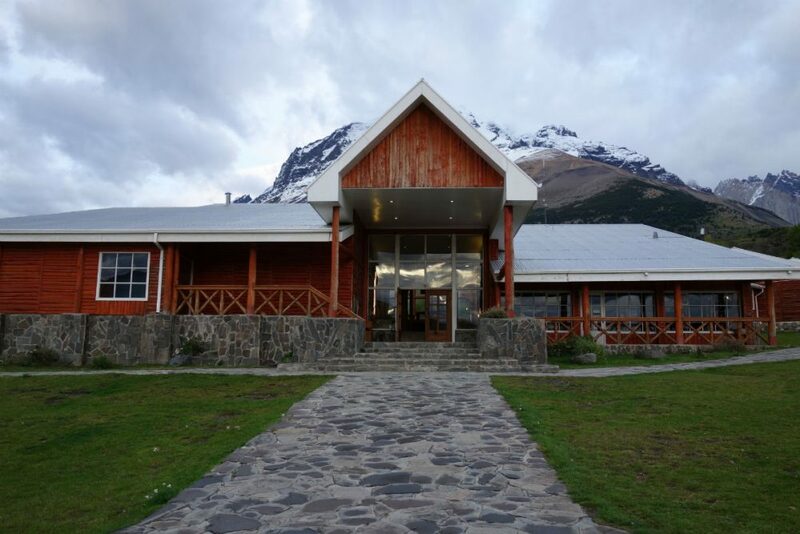 Many of the fanciest hotels in and around Chile’s Torres del Paine National Park operate on an all-inclusive basis, bundling accommodations, meals, and daily activities led by their in-house guides. This means you’re beholden to their schedule, and that you’ll be hiking as part of a small group. (The one exception is the Awasi, which gives each party of travelers its own private guide). If it’s important to you to hike at your own speed, to choose which trail you want to do on any given day, or simply to have privacy, you’ll need to stay somewhere that allows you to bring your own guide. 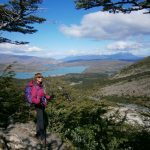 That’s the tack I chose: I divided my time in Chile between the Hotel Las Torres Patagonia, where you can hike straight from your door, and the Rio Serrano, which offers a gobsmacking, panoramic view of the mountains from just outside the park’s boundaries. Having my own guide allowed me to move faster than a group could, and to repeat a hike when we hadn’t been able to reach the top due to a trail closure. Economically, it’s a toss-up: Hiring a private guide and staying in four-star properties is roughly equivalent in price to booking an all-inclusive experience at a five-star place. On the Argentine side of southern Patagonia, the town of El Chalten was incorporated just over 30 years ago and has the feel of a place still not sure of its measurements and without a sense of permanence; the streets are wide, but most are dirt and gravel. I came across one house in town made from a shipping container, another from the trailer of a big rig. The most interesting regional history you’ll find on the Argentine side is out at the remote Estancia Cristina—now within the national park and accessible only by boat—where a pair of English pioneers set up a sheep farm in 1914. In their old shearing shed, you can browse their hand-built farming equipment and the ham radio they used to stay connected to the outside world. Hotel Las Torres Patagonia, on the Chilean side, does have a small but good information center with a few panels that talk about the indigenous people who once called this harsh landscape home. Our guide also brought us to some little-known rock art in Torres del Paine National Park, at the end of a trail so seldom used that grass has grown over it. So don’t come to Patagonia looking for culture. While it’s technically summer when the vast majority of visitors arrive in Patagonia, temperatures rarely crack the 70s, and the weather can turn on a dime, bringing rain (or snow) at just about any time of year. So you’ll need to pack for several seasons’ worth of weather. The region’s wind is infamous; I didn’t fully believe the stories I’d heard until I had to hold a staggered, wide-legged stance just to stay upright through one major gale. (Locals track the weather via a website called Windguru, which shows hour-by-hour changes in wind speed, gusts, and direction.) I chose to travel in March, when the wind is less troublesome than during the height of summer—and the crowds thinner. Got other questions about Patagonia? Ask me in the comments below. 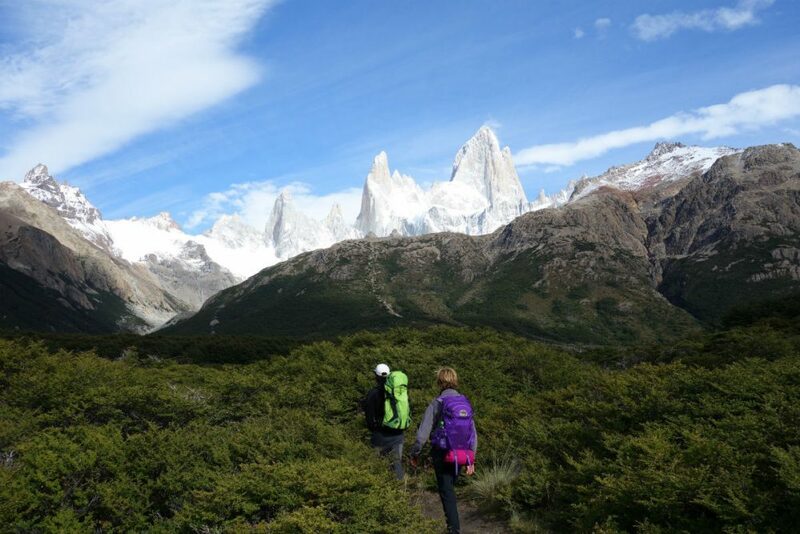 Disclosure: Tom Damon provided a press rate for this writer’s trip to Patagonia. In keeping with WendyPerrin.com standard practice, there was no request for coverage, nor was anything promised. You can read our sponsored travel agreement with Tom here. Advice for hiking and walking trips based on hundreds of miles’ worth of trail data: the pros and cons of hiring a private guide or joining a group trip. 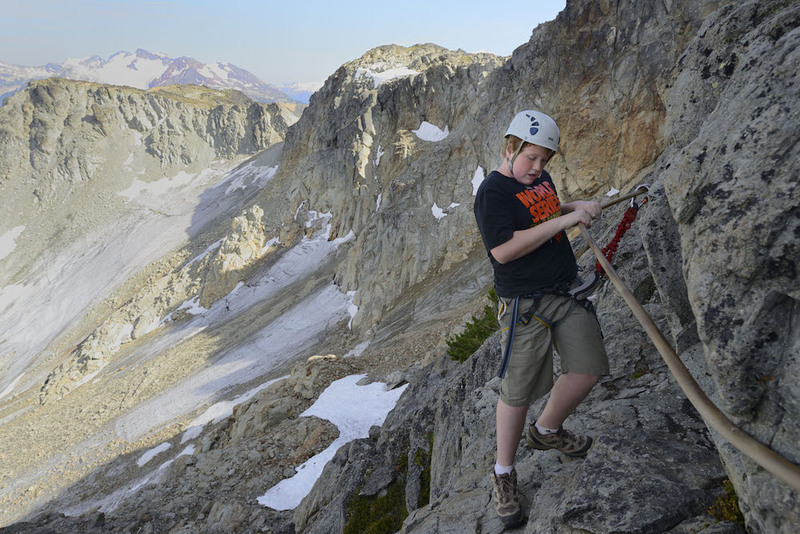 Whistler's Via Ferrata is one of the mountain’s best-kept secrets; very few locals have heard of it. So, of course, Wendy was willing to try it.